<?xml encoding="UTF-8"> California Bail Agent Pre Licensing THE PC 832 40 HOUR Powers or Laws of Arrest Course is 50% of the legally required certifications for the vast majority of persons wishing to legally bounty hunt in California. (3) The person shall have completed a minimum of 20 hours of classroom education certified pursuant to Section 1810.7 of the Insurance Code. “Bail fugitive recovery person” means a person who is provided written authorization pursuant to Sections 1300 and 1301 by the bail or depositor of bail, and is contracted to investigate, surveil, locate, and arrest a bail fugitive for surrender to the appropriate court, jail, or police department, and any person who is employed to assist a bail or depositor of bail to investigate, surveil, locate, and arrest a bail fugitive for surrender to the appropriate court, jail, or police department. Bounty Hunting Schools California from Rex Venator on Vimeo. How Important is Arrest and Control Training in Bounty Hunting? Please See the Below Video Wherein Rex Venator, a Former Police Academy Tactical Officer, Applied PC 832 P.O.S.T. Academy Approved “Compliance” Techniques to Subdue the Profiled Bail Jumper Before Help Could Arrive to Assist in the Bail Apprehension. THE PC 832 40 HOUR Powers or Laws of Arrest Course is 50% of the legally required certifications for the vast majority of persons wishing to legally bounty hunt in California, and, very bluntly stated, I am growing increasingly fatigued by the ongoing reports from Bailspeak Alumni indicating that certain key personnel at various organizations offering the course are presenting as insensitive, “holier than thou,” bothered, and, as this state of intolerable affairs continues, allow me these very small concessions for Bailspeak Alumni only: California Powers of Arrest P.O.S.T. Approved College PC 832 40 Hour Powers of Arrest Monday through Friday Certification classes specially set aside for Bailspeak Alumni rosters of 15 to 25 Attendees for both aspiring bounty hunters AND bail agents licensed after January 1, 2000 who are not licensed private investigators. Unlike other organizations, Bailspeak Alumni will not be required to take the PC 832 Firearms portion, but I strongly suggest doing so if one has little to no firearms training or experience with firearms. 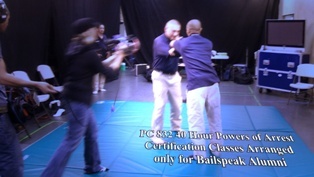 Unlike other organizations, Bailspeak Alumni will not have to worry about classes maxing out or classes getting cancelled; indeed, by and through special arrangements by Bailspeak, additional defensive tactics instructors will be brought in to accommodate Bailspeak Alumni overflow with classes kept small. 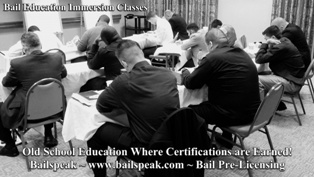 Bailspeak Alumni who have spent 22 hours in class with me as the bail agent pre-licensing instructor may private message me or Bailspeak on Facebook or by my direct email (Bailspeak Alumni have my personal business card) and provide the following: Your Name, Date and City of Your Bailspeak Class, Contact Phone or Cell Number, and Your Email Address. From there you will be contacted on how to proceed to sign up for the class. Be mindful that there will most likely be travel and lodging expenses to consider, so don’t sign up if you can’t commit to a Monday through Friday academic and very physical class. This offer is ONLY for Bailspeak Alumni, and please do not call the Bailspeak Registrar to sign up because this is a “Mothersuaresrex” special, solo project to respond to too many reports of “my people” not being treated with the respect they deserve—too many credible reports have prompted this action. Thank you and I hope this works because the “holier than thou” crowd, in my personal opinion, should have treated “my people” with the good manners and the respect they deserve. This is a pilot program in service of Bailspeak Alumni; let’s make it work. Facebook is not connected to my cell, and I am always working. I will check in and get back to interested persons accordingly. Rocking the status quo establishment is a hallmark of how I operate. A: The 5-Day Monday through Friday Powers of Arrest course is $115.00 collected at-the-door, and students will have to secure their course materials in advance at a cost of approximately $46.00. Bailspeak Alumni will be contacted by email with further information on how to secure their seats with deposits or pay-at-the-door, though admittance isn’t guaranteed absent the seat security deposit. Q: Where is the class? A: Attendees will be advised of where the class is in advance so that lodging arrangements can be made well in advance. The cryptic nature of this answer is due to the fact that bounty hunters and bail bondsmen are generally very concerned about personal security and Bailspeak understands and respects these valid concerns. Q: Is the firearms portion of the 832 required to be a bounty hunter? A: No; however, if one has never handled a firearm or if one is purely military trained and experienced then it is suggested that students consider taking the firearms portion of the PC 832 Course; nevertheless, the firearms portion is NOT required to become a bounty hunter. Q: How much is lodging in the area where the class will be? A: Bailspeak is currently working on a Special Bailspeak Student Rate at a Hilton rated hotel. Q: I am not a Bailspeak Alumni, and other PC 832 Courses are full well into the middle of the following year. May I sign up and get into the 40 Hour Laws of Arrest Courses? A: No. This PC 832 Class offering is only for Bailspeak Alumni, and it is important to keep the seats open for Bailspeak Alumni only so that they don’t find themselves put off by other PC 832 class offerings into the next calendar year. Q: I am a Bailspeak Alumni. How do I get on “The List” for this PC 832 40 Hour Powers of Arrest Course? Q: I am a bail agent. Why do I have to take this course? A: Any person who is not a licensed private investigator, was licensed after January 1, 2000, does his or her own bounty hunting, and who has never taken the PC 832 Powers of Arrest Course is required by California Law to secure and carry this legally required certification on them while bounty hunting. Witness the below Remarkable video wherein Rex Briefs a Veteran and Street Training Team of Bounty Hunters with an Astounding Intel Dump of Information Collected long Before ever setting out to Knock on Doors in Search of a Wanted Felony Bail Bond Fugitive with numerous Felony Warrants issued by a superior court. THE CHECK FOR $7,000.00 was made with a total of seven (7) hours of actual operational remedies that included drive time from and to the Office; that is $1,000.00 an hour to leave, talk a very dangerous wanted felony bail fugitive out of an attic, and follow the police back to the their station to get my handcuffs back! BOUNTY HUNTING is unlike any other trade that I can think of, but is also an amazingly difficult way to get started and turn the red ledgers into black ledgers. Conversely, I’ve spent months traveling vast distances, knocking on dozens and dozens of doors in search of just one (1) wanted felony bail fugitive, but that is the job—for better or worse, it is the amazing job. Here I’d like to bring the reader’s attention to some SERIOUS DUDES. 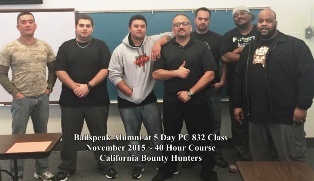 Pictured are Bailspeak Alumni, ranging from all over California, who did what it took to travel and get their mandatory 20 Hour Bailspeak Certificates and then did it again to take the mandatory five (5) day California Penal Code 832 40 Hour Powers of Arrest course in the first steps to become bounty hunters. The operative term I’d like the reader to consider in the above paragraph is “...who did what it took...” in terms of time, travel, expense, and personal sacrifice, because THAT is What it Takes to even think of Becoming a Bounty Hunter. Each PC 1299 Compliant Bailspeak Alumni pictured did not TELL how serious they were; they SHOWED it without speaking a word; THAT is what it Takes to be a Bounty Hunter. I’d like to wrap here by extending my congratulations to California’s Newest Bounty Hunters who “did what it took,” and the unaffiliated independents should consider firing me off their resumes because I’ve some killer leads on some killer full-time jobs and with all the perks that go with such bounty hunting positions. This Course is a one (1) Unit Course through a college. Please Scroll Down to Frequently Asked Questions for More Information.